Games developer Valve has given its first indication that the long-awaited next instalment of its celebrated first person shooter Half-Life is finally on the way. 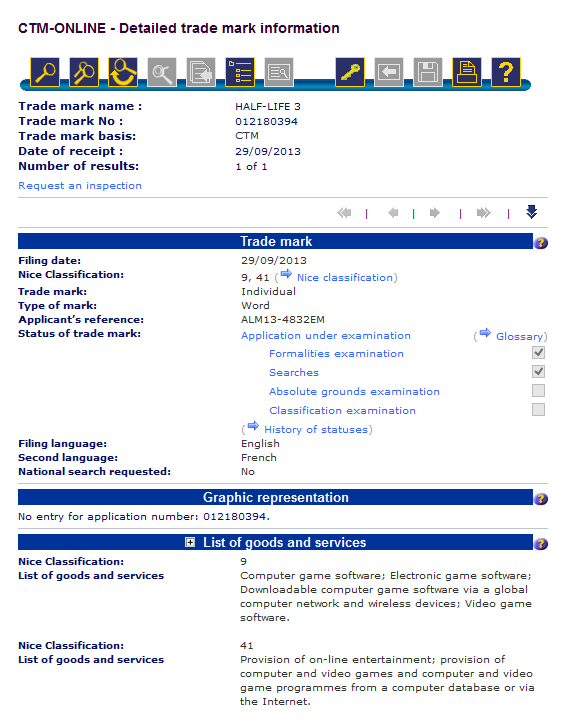 In a trademark application filed in the EU on September 29, the company registered the name Half-Life 3, which is referred to as ‘video game software’ within the document. The application, filed with the Office of Harmonisation for the Internal Market lists Valve as the owner of the property. It has been over six years since the last game, Half-Life 2: Episode Two, which appeared on Windows, Xbox 360, PS3, Mac OS X and Linux as part of The Orange Box games compilation. That also included the previous two instalments; Half-Life 2 and Episode One as well as the Team Fortress 2 and Portal games. While demand for a third full version of the game has remained high in the last few years, Valve hasn’t taken its foot off the gas with its other projects. Since that time it has worked on the Left 4 Dead series, a Portal sequel and also pioneered its own cloud gaming platform, Steam. Just last week the company announced a three-pronged plan to take over the living room with its Steam OS, Steam Machines PC-based consoles and a unique Steam Controller gamepad, all of which will launch next year. The trademark filing will, at last, give Half-Life die-hards hope that Valve is set on returning to the game which brought it to the dance.